If you’re a dual sport lover, you need protection while you’re on the highway getting to your dirty destination. The right gloves for the ride will offer the breathability and flexibility of a dual sport glove along with some protection of a sport / sport touring glove. The Dainese X-Strike Gloves are crossover gloves that can go back and forth between the sport, sport touring and ADV world. With the extra protection that these gloves offer, you’re no longer limited to the pavement. A slightly more ergonomic pre curve in the palms provides excellent grip, and you will also get solid ventilation and distortion control (a complicated way of saying “so you don’t break your pinky thingy”). Although many gloves feature stitched fingers to keep your 4th and 5th fingers from separating, not everyone likes the way they feel. Instead, Dainese designed their proprietary Distortion Control Protection or “DCP” from their race glove lines and added it to this lightweight glove. In addition to the DCP, you’ll find palm sliders and Ergo Tec titanium knuckle protection. This Ergo Tec system allows for independent movement between the 1st/2nd fingers and the 3rd/4th fingers. The main difference with the Dainese X-Run and the X-Strike is that you lose the DCP feature on the pinky with the former as compared to the latter. With that being the case, you will also find the -Run at a lower price point. They also don’t have the palm slider, and more suede than leather is used in the overall construction. Aside from those features, however, the gloves will offer riders a very similar experience. 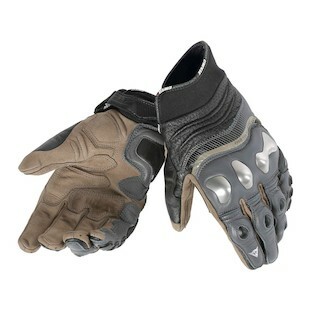 Overall, these gloves are both great options for dual sport, street or sport riding for summer. You’ll find the Dainese X-Strike and X-Run gloves offered in sizes XS-3XL with 3 different color combinations for each.